The Urban Planning Coalition at SJSU is hosting their 8th Annual Urban Planning Symposium on Saturday, April 27th at the MLK Library. 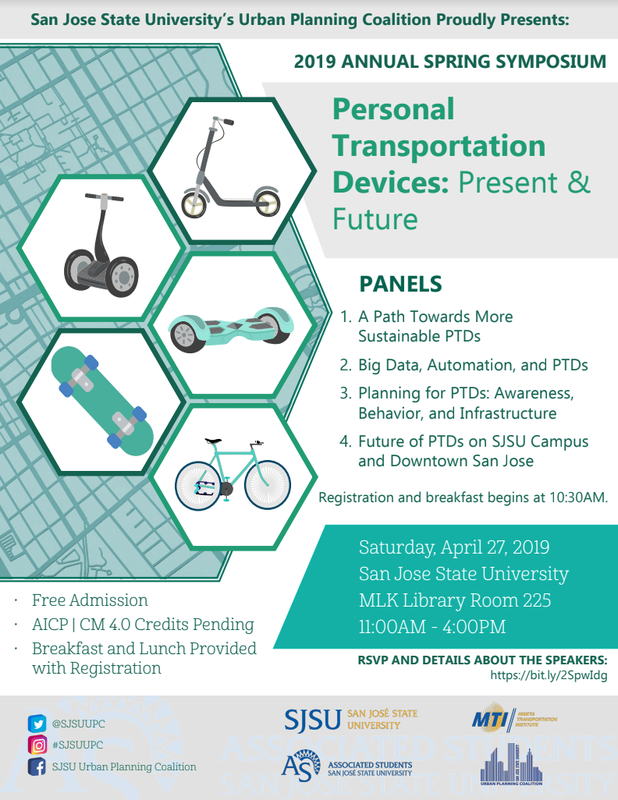 The theme will be of great interest to a lot of the locals urbanists and Downtown residents reading this--personal transportation devices (PTDs). Downtown patrons have become infatuated with scooters, shared bikes, and even funky one-wheel skateboards. The symposium discusses how these devices can become more sustainable, the impact on urban planning, and the future of these devices on the SJSU campus and Downtown. Admission is free and breakfast and lunch are provided. If you are a student you will even get some credits for attending. To learn more about each panel and RSVP, head over here.